At MARTINS BLINDS and AWNINGS we strive to achieve a high level of service in Northampton and across the whole of Northants. 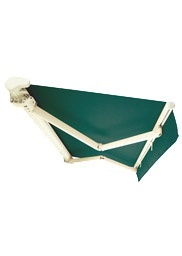 Our Awnings come in a variety of options, styles and colours and we are confident we have the awning solution for you! Luxaflex awnings are one of the best you can get and are renowned throughout the industry for their quality come with a five year guarantee. Choose from a great variety of fabrics from the Dickson Orchestra range. Whether you want cover from the blazing sun or to sit out in less favourable weather an awning is the perfect answer to getting more from your garden. Click any image to view the gallery range. Fabric and arms are left uncovered when retracted. 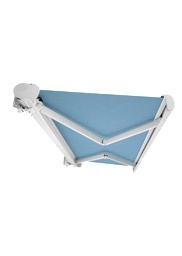 Fabric and Folding arms are covered and protected from the elements when retracted. Make life that bit easier with a remote control for your awning. A remote control will allow you to control the projection of each of your awnings. Fully extended your awning will stop automatically and when retracting the sensors will stop the awning when the action is completed. Adjusting the awning is simple too, press the ‘my’ button to stop the awning in any position. Why let the sun dictate your enjoyment of your garden? 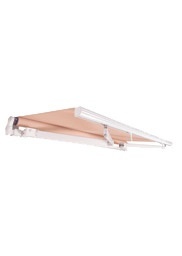 Our Awning lights will give you more time outdoors and can also be controlled through your remote control! Awnings Northampton we look forward to hearing from you or answering any of your queries. 01604 452791 or 07738 733319 – We will check your property’s suitability with a free survey!